I received a Bachelor of Music degree back in 1994. One of my most vivid memories was of a female student conductor struggling to get the orchestra to pay attention to her. I felt her frustration, her humiliation, and her deep desire for respect while standing on that podium. Although I was at the University on scholarship, I was never at the top. A part of me always felt like that student conductor, frustrated. Perhaps my inspiration for writing "Conducting the King" is a combination of that student and me. It's difficult being an underdog, yet, in the long run it makes for a better story, if the underdog persists and succeeds. This book is dedicated to my father, who always rooted for the underdog. He was also a huge Elvis Presley fan. I'm guessing the Elvis theme must have been a seed planted in me long ago, awaiting for the perfect moment to sprout. What has inspired me to write this book, I hope in turn inspires the reader to go after their goal. 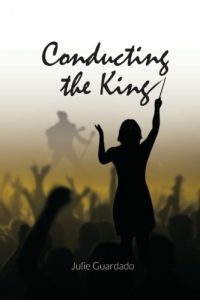 The storyline of "Conducting the King" came to me while I was out on a midday walk. The characters, their names & personalities were instantly alive in my mind. So much so, I ran home and wrote out an outline for the whole book. I had two other books published, but this was my first fiction. This story included Elvis. As my brother said, "There are too many books on him already." That's true, but Elvis isn't the main character of the book. He only makes a two minute appearance in the book, but he is the driving force behind every character thereafter. I feel like I can't take credit for "coming up" with the characters. The majority of the book/characters wrote themselves, as they led me to places and people I never heard of. I didn't know about Mound Bayou, Mississippi, or The South, or even that much about Elvis. The strongest "voice in my head" was that of the character Caleb Freeman, an old southern man, a father figure. I listened to that inner voice and just trusted it/he would tell the story. Because of this, the story, takes place in present day, but has flashbacks to events in Caleb's life that shaped the man he is today. Although fiction, I wanted to make sure I paid Elvis, his legacy, The South, the men that work hard to impersonate him, and everyone who is going after their dream, justice. Once I started the book, I could not close my laptop until it was finished! I still refer to the characters as if they truly existed in real life. I feel that close to them. Caleb Freeman was a short-order cook at Okra & Oxtail, the best southern cooking restaurant between Nashville and Memphis, located off the newly constructed Interstate 40. It was a slow Monday night before closing. The last customer had just left when a Vistaliner tour bus pulled into the small parking lot. Lloyd, his best friend and the restaurant owner's son, was a clearing a table alongside the front window. "Oh, I can't believe it, Caleb," Lloyd said. "Look who the good Lord is blessing us with tonight." From his cooking station, Caleb had a good view of all the tables, but couldn't see the front door. Five men entered and greeted Lloyd one by one. When Caleb head the third voice, his hand holding the spatula jolted up, sending the greens he was sautéing flying. He could recognize that voice out of millions and could not be fooled by impersonators or linguists specializing in the southern drawl. Only one man had this voice. Caleb dropped his head under the hanging heat lamps to look. He was right. There he was. His idol took a seat in a booth along with the other guests. One man took the lead in ordering. "How about three orders of the day's oxtail special, two orders of fried chicken, large side orders of fried okra, beans, and southern greens? And we'll take that to go, if y'all don't mind," he said. Okra & Oxtail was a dine-in establishment and wasn't really prepped for to-go orders. The restaurant had small boxes for left overs, but nothing big enough for full orders. But Lloyd said he'd have the order right out. As Lloyd turned back to the kitchen, Caleb could see his usually pale face flushed with excitement. His big green eyes were wide and unblinking. Lloyd ran to the back and opened every supply cabinet. Caleb heard him shoving things to the side, scrounging around to the back of the cabinets. Lloyd whipped by and threw down a pile of large to-go boxes next to Caleb who was prepping the side orders blindly. He couldn't take his eyes off the dark-haired man, the side-burns, the wavy lips, the color of his skin. He'd never gawked at another man before, but this was an exception. This was Elvis Presley. "You should go serve them Pepsi-Cola, on the house," Lloyd said. Caleb shifted his footing, took another look under the heat lamps, then looked back at Lloyd. "Ain't nobody here but us. Here, put on my apron." "You think it'd be all right?" Lloyd didn't answer but removed his apron and handed it to Caleb. As Caleb slid the apron over his head in what felt like slow motion, Lloyd filled five tall glasses with ice and soda. Caleb cleared his throat before entering the dining area with the tray full of drinks. His breathing was shallow. He had no intention of saying anything beyond what needed to be said. He knew his place. "On the house, gentlemen," he said, giving each man their drinks, serving his idol last. His hands were shaking lightly. He hoped none of the men would take notice. "That's awfully kind. Thank you," said Elvis. Caleb looked him in the eye and gave a slight nod, then returned to the kitchen to finish the order. He could hear the five men talking shop: guitars, vocal arrangements, last night's crowd, and rehearsal schedules for the coming weeks. Between chopping and sautéing, he'd look over at them. How he would love to talk shop with them. He imagined himself telling them about a new arrangement he'd developed for "(There Will Be) Peace in the Valley." He'd first say how he liked Elvis's interpretation more than that of Sam Cooke, or even Mahalia Jackson. He'd compliment Elvis on the slow, subtle way he sang the lyrics. Then, he'd talk about his own arrangement of the song, how he'd composed a simple three-part harmony backup vocal section with skeletal piano chords playing against a haunting cello. He imagined Elvis saying, "A cello? That's nice," to which Caleb would respond, "Yes, sir. Born and raised on the Mississippi Delta, right in Mound Bayou. Rhythm and blues run through me, but I like experimenting with other instruments." "Did you tell him you're his biggest fan?" Lloyd asked, breaking Caleb's daydream. "No, I didn't. I didn't need to." "This may be your only chance." Caleb shook his head and took off Lloyd's apron. "Go give them their orders," he said. "They're waiting." Lloyd took the food out to the men and all the men stood up and exited the restaurant, except Elvis. He lingered, then reached for a wallet in his back pocket and took out a bill. He walked over to the bar near Caleb's window. Caleb made eye contact with him. Elvis, no longer the image but the real person, placed the bill down, tapped it twice and returned Caleb's nod. Caleb mouthed, thank you. Elvis flashed his dimpled smile as he turned away. Lloyd stared at Caleb, who stood there, silent and smiling. He could hear Lloyd exhale loudly, as if trying to get his attention. "Well, take it!" Lloyd said. "I will, I will. I'm enjoying the moment." Caleb approached the counter and picked up the money. It was a crisp two-dollar bill. He stared at the front of it, and then the back, then folded it in half and placed it securely in his wallet. As he cleaned the kitchen, he kept passing his hand across his back pocket to make sure the wallet was still there. With every confirmed pass, he let out a little giggle or sigh. He knew he'd have to find a secure place for the bill, a place where it could be close and always felt. He silently hoped this wasn't his only chance, as Lloyd has said. He needed to be more prepared next time to show his respect and appreciation for The King of Rock and Roll. When he did see Elvis again he now had something to talk about. He could give a proper thank you for the two-dollar tip and say, "Look here, I still have it." He'd whip out the bill and ask Elvis to sign it. "Wow, the power of one man," he whispered to himself. Caleb felt something change within himself. He couldn't pinpoint exactly what had altered, but knew this was a defining moment of some kind. There'd been a shift and only time would tell how it would manifest. He imagined this was what a seed must feel like when planted in soil. Interact with Author, ask questions, receive excerpts of future works!